Pilaf cooked everywhere from India to Spain, only it's called differently. Often "saw". 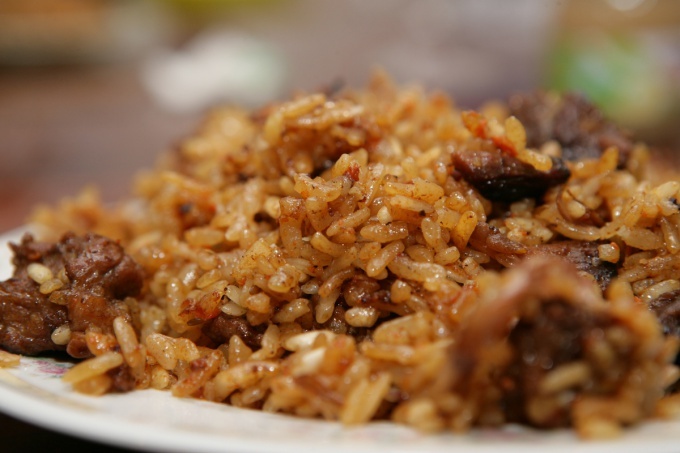 In Russia began to prepare the pilaf with immigrants from Central Asia who insist that traditional rice is only a fat-tailed lamb. No goat, chicken and of course pork. Cut 500-700g lamb. If meat is quite lean – add 10% sheep fat. Buying, take only chilled meat. The fact that you are not trying under the guise to impose the cooled melted mutton, you can check the following method. Press down on the pulp so as to form a recess, remember the piece, stand for 3-4 min. When I come again, really chilled meat recesses should not be. Meat, frozen and thawed once, you can see a barely noticeable hole, and if that is clearly visible – freezing procedure was carried out repeatedly, such meat should not take. Glow cauldron or a large casserole – baking dish. When choosing cookware it is important to consider two factors: it must be thick and of high thermal conductivity. Glow, place it in the fatty pieces of meat or fat. Stir until the fat will not mytopics. Lower in fat spices: 5-10 pieces of cloves and allspice, a few Bay leaves, 1/2 tsp of cumin (cumin). Cumin is a traditional spice of Central Asia, resembles caraway seeds. Selling more can be found under the name "cumin" - so it is called in Europe and in India, where I came from. To cook good rice, this spice is really needed. Add the fried spices sliced lamb. Stir so that the meat pieces are evenly covered with fat and spices. Fry on high heat for 10 minutes, then season with a little salt. Grate 300g of carrots. Cut into dices or cubes the same amount of onions. Put the vegetables in layers on the meat, do not stir, cover the cauldron or casserole with a lid and simmer on low heat about a quarter of an hour. Boil in kettle of water. Prepare Fig. It is usually take about a third of the meat. In other words, for every kilogram of mutton pilaf makes sense to put 300-350g of rice. Remember that it will increase its volume by almost two and a half times. Pour the washed rice on top of vegetables, pour boiling water, but boiling water should not reach the edges of the patches or the cauldron by 25%. Salt. If you want a pilaf, you can add 2-3 garlic cloves. Cover the leaves with garlic is not removed, it in pilaf exclusively to give your taste. Before serving, the garlic should be removed. Periodically check the condition of the fluid: if it is to boil – pour. Stir the pilaf in a pinch, traditionally pilaf stir at the time, scooping a large spoon all the layers of this delicious Oriental dishes. Cooking pilaf, watch carefully to not burnt. Burnt risotto – not the most pleasant dish, and will certainly ruin the mood. When you put the lamb pilaf in cauldron, give her some time to obzharitsya without a lid. Hot temperatures seals the meat, leaving the meat juice inside.